Originally from Santiago, Chile, I have travelled the world, working, cooking and bringing the diverse influences of my past and my passions into my food. Breeder's Cup- "Taste of The World"- Speed Art Museum, Louisville, KY.
KentPresents Ideas Festival - Kent, CT.
A native of Santiago, Chile, Blamey was a student of history until she course-corrected into the professional kitchen, leaving university to attend the International School of Culinary Studies in Santiago. Though she came to cooking relatively late, Blamey immediately set her sights on the rarefied air of fine-dining, and was especially drawn to Michelin-lauded, tasting-menu restaurants. With that mission in mind, in 2004, Blamey took a position at the two-Michelin-star The Vineyard at Stockcross, under Chef John Campbell, then moved to Melbourne, Australia, as Chef de Partie at Interlude, the first restaurant in the country to offer a degustation menu. 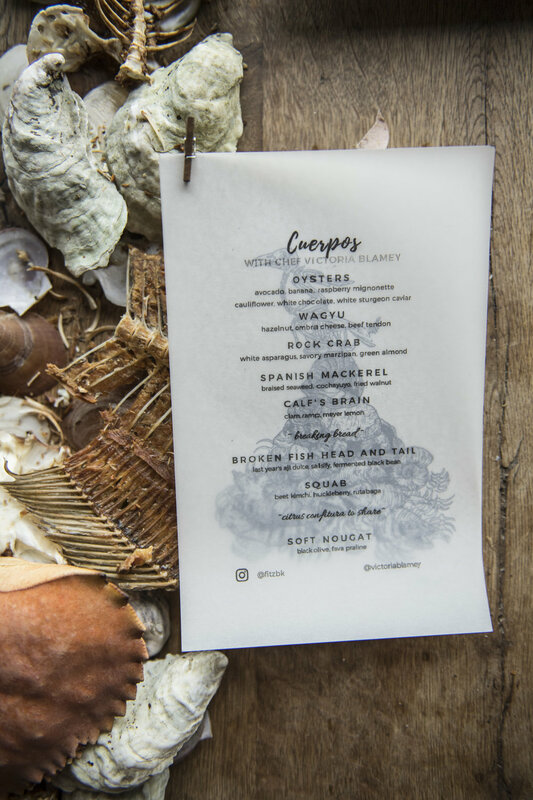 In 2007, Blamey took her self-styled education to the next level, staging at one of the most acclaimed restaurants in the world, Chef Andoni Luis Adruiz’s Mugaritz, in San Sebastian, Spain. She distinguished herself at the fish station, so much so that upon completion of her stage, the restaurant offered her a full-time position. It was a galvanizing experience, igniting in Blamey a sense of creative ambition and clarity that she followed to stages at Wylie Dufresne’s WD-50 in New York City, and ABaC in Barcelona—at both restaurants, she devoted most of her time to pastry, which demanded technical precision while also providing additional visual inspiration. In 2010, she began a run of kitchen positions at some of the most exciting and lauded modern restaurants in the United States working with some of its most visionary and accomplished chefs: as Chef de Partie for Paul Liebrandt at Corton in 2010; as Sous Chef to Chef Matt Lightner (an acquaintance from Mugaritz) at Atera in 2011; then back to Corton in the prized position of Chef de Cuisine. She then shifted gears for a few years, working as both Sous Chef and Chef de Cuisine to Chef Justin Smillie at Il Buco Alimentari e Vinieri and Upland, before opening Chumley’s as Executive Chef. As she looks forward to her next chapter, the always-energized Blamey has been creating pop-up restaurants and experiences with popular chefs and restaurants in both New York City and Chile, inviting diners to enjoy her signature cuisine while continuing to evolve it for her next professional home. Photography by Evan Sung unless otherwise noted. Bio graciously provided by Andrew Friedman.